Hundreds of students turned up at the University of Otago campus this morning to farewell law academic and former dean of the faculty of law Professor Mark Henaghan, who has taught at the university for 41 years. Prof Henaghan, who is leaving to take up a position as family law lecturer in at the University of Auckland, delivered his final family law lecture at Otago on Thursday morning. He stepped down as the dean of the faculty earlier this year, after holding the position for 19 years. A good crowd turned out to farewell Prof Mark Henaghan at the University of Otago today. After reading an excerpt from The Happy Prince by Oscar Wilde and delivering advice to his class on the importance of collegiality, persistence, being prepared, listening and not being afraid to stand up for what they thought was right, a visibly emotional Prof Henaghan received a standing ovation from his class. Members of the law faculty then streamed into the lecture theatre to farewell him, with dean Jessica Palmer and Society of the University of Otago Law Students president Tim Austen delivering speeches. Prof Henaghan was made SOULS' first life member. 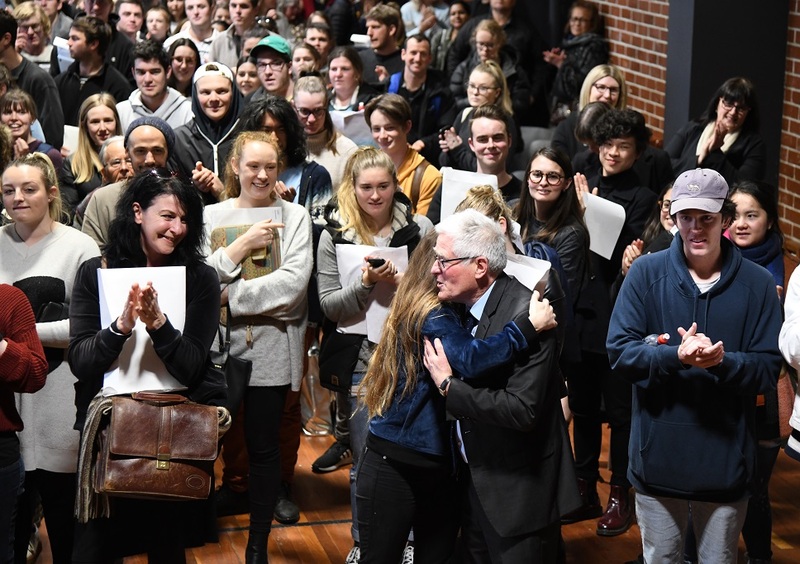 About 400 students formed a "guard of honour" for Prof Henaghan as he walked from the Archway lecture theatre to the Union Hall at the university, where SOULS members performed a song for him composed during the law revue this year. Wow - that bought a tear to my eyes , now that is nothing but respect, enjoy your retirement Prof Mark Henaghan. Have you ever though of running for the Mayor? if people have that much respect for you then just how well you would do as Mayor and how well could you shape Dunedin and move it forward. Brilliant lecturer. Brilliant advocate and promoter of the University around NZ and the world. Brilliant recruiter for the University. Brilliant community service using his intellectual might and warm wit. Brilliant advocate of any student or colleague in need or in trouble. The man is **total class**, and him leaving is a massive loss to the university and Dunedin. Huge thank you for all you have done, Mark Henaghan!